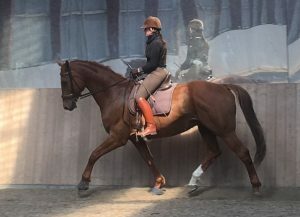 Harmony with the partner horse and the joy of movement up to the highest dressage lessons – this is still the ideal of riding, but the reality is often different. The natural facilities of the horse are not cultivated in patient, well thought-out work, but rather lessons are to be worked out quickly and the movements of motion are as spectacular as possible for the viewer. Horses which are ill with body and psyche are often the result. Christoph Ackermann opposes this with love and empathy, systematics and unconditional precision in the equestrian work. The pupil of the famous riding master Egon von Neindorff wants to encourage all readers who want a nature-oriented education and harmonious riding not to be swayed by the circulating half-knowledge and to go their way by horse. or this he gives them a clear, reliable framework for their daily work: The classical principles of the old masters, which are conveyed here in a very understandable way, apply from the first steps in the training of the Remonte and provide lightness still in the most difficult lessons such as piaffe, passage or gallop pirouettes. The training of Ackermann’s own Hanoverian “Scirocco” also proves that this book can serve as a valuable guide to an entire equestrian life. Parallel to the main text, it is vividly explained how the gelding matures over the years thanks to systematic training from a lanky young horse to a healthy, successful dressage professional. The numerous excellent photos of the elaborately designed ribbon teach impressively what satisfied horses look like under the saddle, namely powerful and relaxed at the same time. Pre-order at the preferential price of OLMS Verlag is possible here! The correct seat is the basic of all good riding “with the horse” and not against it. In the calssical sense of riding it’s a whole system which has to work, if you want to get harmony between horse and rider. Only if you have the cooperation of the back of your horse (only than) you can start to flex the hanches. For getting this status it needs tons of correct riding without tipps and tricks and work for both parties. But this work is never ever against the horse, because it’s our work to make us understandable for our horse and it is NOT the job of the horse to understand inconsequent and therefore inconsistence aids of the rider!